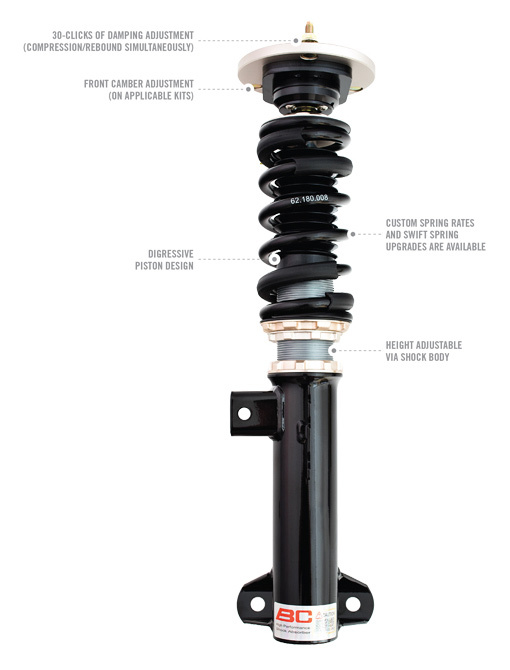 Allow for better performance, vehicle lowering and reduce body roll with a BC Racing custom coilover suspension upgrade. BC Racing's proprietary digressive piston design offers increased damping force at low piston velocities while maintaining a linear damper feel at higher piston velocities. One of the greatest advantages of increased low-speed damping force relates to what the driver feels, e.g. roll, pitch, dive and quick weight transitions on technical road courses. The BC Racing HM Series Coilover system offers the same great benefits of the RM Series with the addition of 2-way damping adjustment. 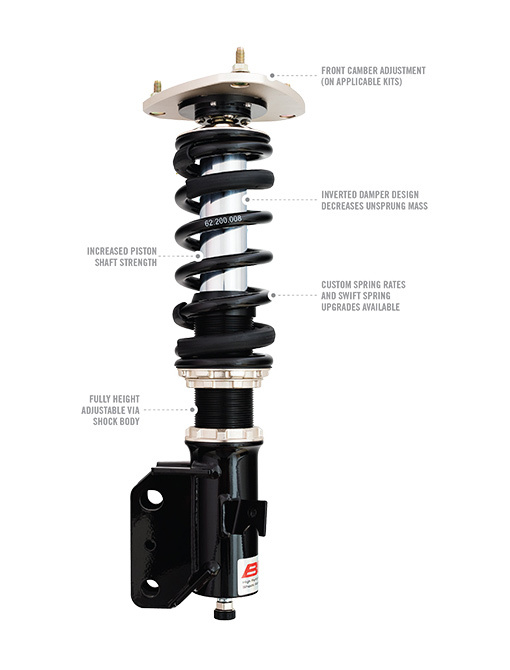 Each HM Coilover system offers inverted mono-tube dampers with independently adjustable compression and rebound. The inverted damper design moves vital damper fluid away from detrimental heat sources to avoid overheating, which can cause damper fade under extreme track use. The inverted damper also allows for decreased unsprung weight by moving the majority of the coilover mass up to the chassis where weight can be shaved more easily. 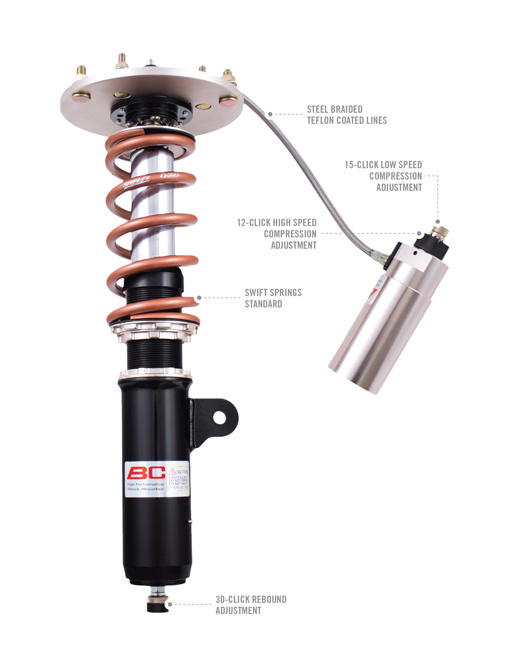 With the BC Racing HM Series Coilover System, the external reservoir exits the damper at the top allowing for infinitely variable mounting locations under the hood or in the trunk for easy adjustment at the track. The combination of inverted mono-tube dampers and external reservoirs make the HR Series suited for the most demanding users on the track. ** Not all vehicles allow for inverted rear dampers, in such cases an upright mono-tube damper will be supplied where the braided line/hard stem for the external reservoir exits the base of the damper. ** Please note that not all vehicles use camber plates in the front and/or rear. In such cases pillowball top mounts are supplied in place of camber plates. Some vehicles reuse OEM upper mounts. 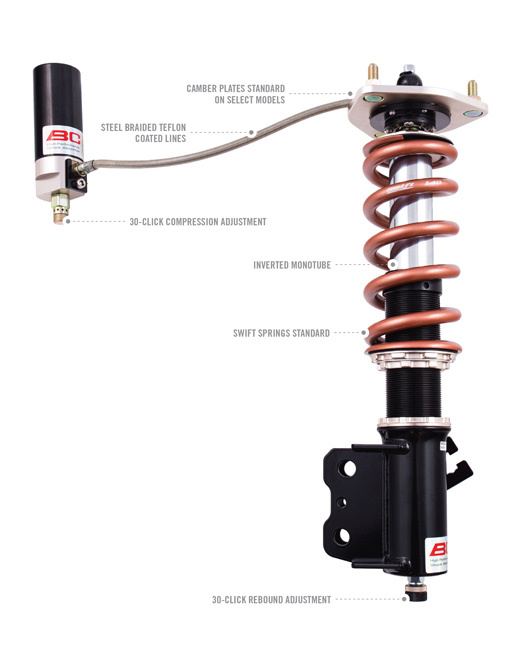 The BC Racing ZR Series Coilovers bring a 3-way adjustable track ready coilover system to racers from novice to pro for an affordable price that has never been seen in the industry. 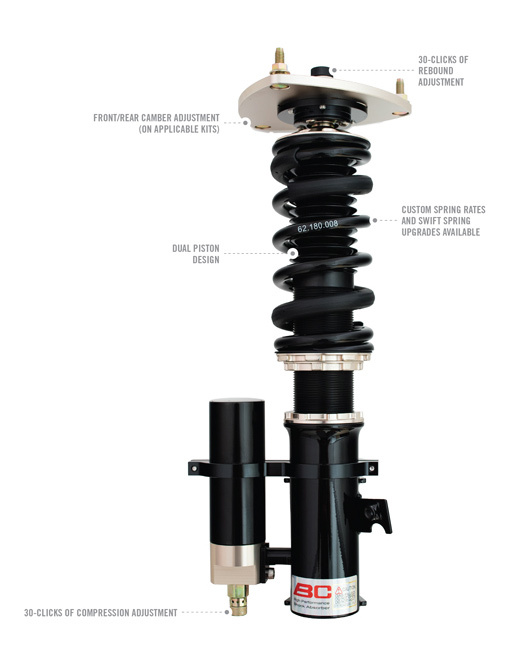 Each ZR Series Coilover system offeres independent low-speed/high-speed compression adjustments and separate rebound adjustment. 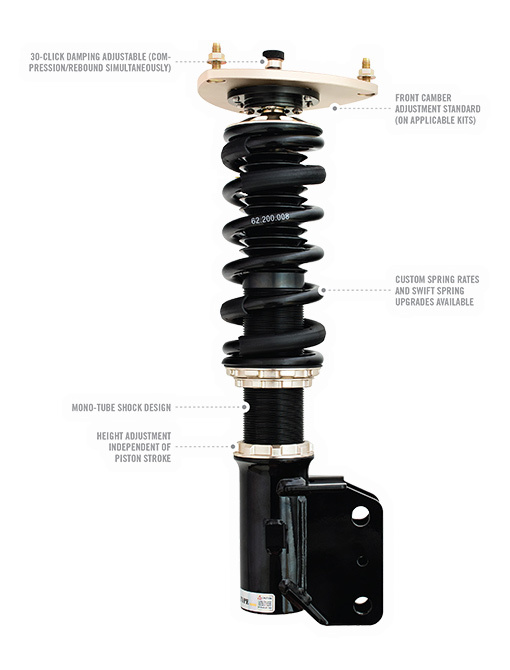 On cars with McPherson struts, the ZR Series comes standard with an inverted mono-tube damper. The damper has a steel braided Teflon coated line exiting the top of the damper to the external reservoirs that can be remotely mounted on the chassis for easy adjustment. Cars with double A-arm suspension come with upright dampers. These dampers have steel braided Teflon Coated lines or solid stem that exit the damper at the bottom and lead to the external reservoir that can be mounted under the chassis or on the shock body itself. The ZR Series offers 30- clicks of rebound adjustment, 15-clicks of low speed compression adjustment and 12-clicks of high speed compression adjustment.